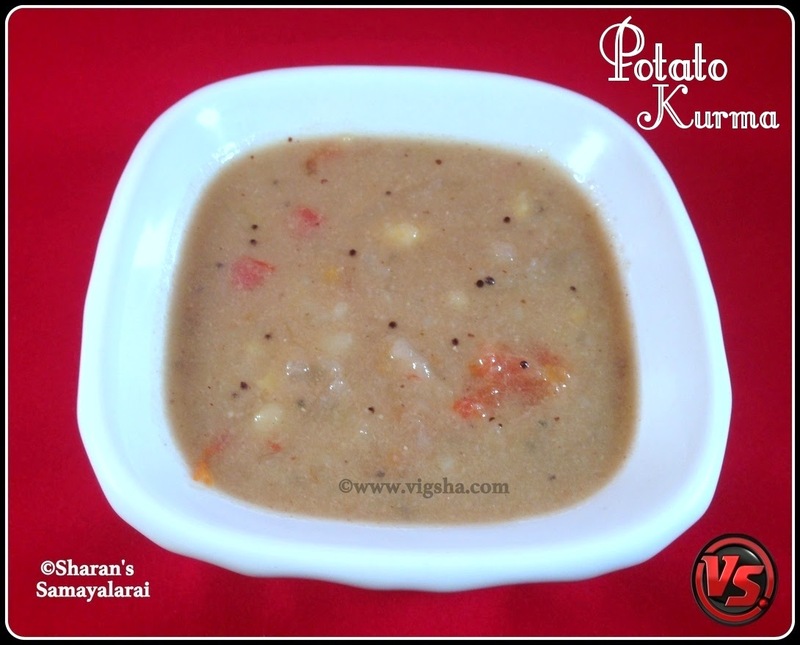 Simple Potato Kuruma is an authentic Kongunadu recipe. This simple home style gravy goes well with Idli, dosa varieties and brown upma. This is my mom's recipe and I have loads of childhood memories associated with it. 1). Boil potatoes and mash it, keep aside. In a mixer, grind the items listed under 'to grind' with little water to a fine paste. Keep aside. 2). Heat oil in a pan, add mustard and let it splutter. Then add sliced onions and saute till they turn light brown. Add tomatoes and saute till it becomes mushy. 3). Add the grounded masala and mix well. Add water and adjust the consistency accordingly. When it begins to boil add the mashed potatoes and combine well. 4). Let the kurma boil until the raw smell goes and the gravy reaches thick consistency. Switch off and garnish with coriander leaves ! # The kurma thickens a bit after cooling. Adjust the consistency of the kuruma as you desire. # This kuruma also goes with chapathi varieties, use red chillies instead of green chillies. # You can also include other veggies along with potatoes.